Describe three examples of safety equipment used in a chemistry laboratory and the reason each one is used. Describe what a safety data sheet (SDS) is and tell why it is used. Obtain an SDS for both a paint and an insecticide. Compare and discuss the toxicity, disposal, and safe-handling sections for these two common household products. Discuss the safe storage of chemicals. How does the safe storage of chemicals apply to your home, your school, your community, and the environment? Predict what would happen if you placed an iron nail in a copper sulfate solution. Then, put an iron nail in a copper sulfate solution. Describe your. observations and make a conclusion based on your observations. Compare your prediction and original conclusion with what actually happened. Write the formula for the reaction that you described. Describe how you would separate sand from water, table salt from water, oil from water, and gasoline from motor oil. Name the practical processes that require these kinds of separations. Describe the difference between a chemical reaction and a physical change. Cut a round onion into small chunks. Separate the onion chunks into three equal portions. Leave the first portion raw. Cook the second portion of onion chunks until the pieces are translucent. Cook the third portion until the onions are caramelized, or brown in color. Taste each type of onion. Describe the taste of raw onion versus partially cooked onion versus caramelized onion. Explain what happens to molecules in the onion during the cooking process. Describe the chemical similarities and differences between toothpaste and an abrasive household cleanser. Explain how the end use or purpose of a product affects its chemical formulation. In a clear container, mix a half-cup of water with a tablespoon of oil. Explain why the oil and water do not mix. Find a substance that will help the two combine, and add it to the mixture. Describe what happened, and explain how that substance worked to combine the oil and water. Name two government agencies that are responsible for tracking the use of chemicals for commercial or industrial use. Pick one agency and briefly describe its responsibilities to the public and the environment. Define pollution. Explain the chemical effects of ozone, and global climate change. Pick a current environmental problem as an example. Briefly describe what people are doing to resolve this hazard and to increase understanding of the problem. Briefly describe the purpose of phosphates in fertilizer and in laundry detergent. Explain how the use of phosphates in fertilizers affects the environment. Also, explain why phosphates have been removed from laundry detergents. Visit a laboratory and talk to a practicing chemist. Ask what the chemist does, and what training and education are needed to work as a chemist. 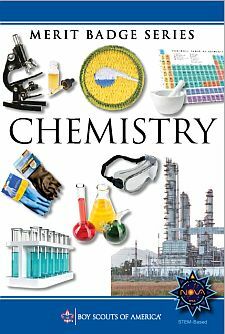 Using resources found at the library and in periodicals, books, and the Internet (with your parent's permission), learn about two different kinds of work done by chemists, chemical engineers, chemical technicians, or industrial chemists. For each of the four positions, find out the education and training requirements. Visit an industrial plant that makes chemical products or uses chemical processes and describe the processes used. What, if any, pollutants are produced and how they are handled. Visit a county farm agency or similar governmental agency and learn how chemistry is used to meet the needs of agriculture ,in your county.